Announcement We love our customers! Thank you for your support and business. 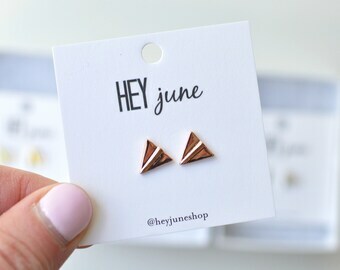 Those who follow us on instagram @heyjuneshop always know when the next sale is and have first eyes on new products! Not to mention, we give a lot of stuff away! Interested in wholesale pricing? 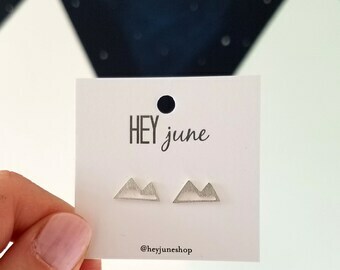 Email us at shopheyjune [at] gmail.com. We love working with boutiques, salons, and local shops! We love our customers! Thank you for your support and business. 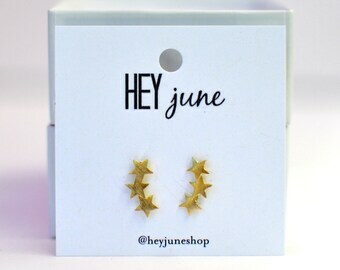 Those who follow us on instagram @heyjuneshop always know when the next sale is and have first eyes on new products! Not to mention, we give a lot of stuff away! I've always been a fan of big, beautiful colors. As an English major in college I was fascinated by all of the color symbolism in so much classic literature. Color represents so much in our life. That's why when I had my first baby in 2014, I desperately looked for a colorful piece of jewelry to symbolize this great event. I wanted a ruby for July, her birth month. I scoured the internet for birthstones but could never find one that fit my taste- simple, beautiful, feminine, but strong and long lasting, too. Finally I decided to make the necklace myself. When I received numerous comments on the necklace, I knew I was on to something. We go through so much in our lives (good times and bad) and we naturally seek out a way to remember these life altering events. At Hey June, our line of colored stones does just that- allows you to tell your story through color, through symbolism, and through a stunning little piece of jewelry. What month did you meet your husband? When did your mom have her last cancer treatment? When did you graduate with that hard earned degree? What month was your favorite grandma born? These are the times in life we want to remember, and Hey June seeks to do just that. Thank you for letting us be a part of your story. We are a small family run business so please understand that we cannot allow returns simply because you no longer want the item. All of our items have 4-5 pictures so you can see the size of the item, where the post on the earring is, and how the jewelry will sit on your neck or ear. We begin processing your order often immediately after you order it- we pay the shipping price, print the shipping label, and begin making the item. For this reason, we can not offer any refunds after you have purchased your item. If there is an error on our part, the item is broken or damaged, or you believe you have been misled on the item, we are happy to work with you and make sure you are happy with your product. I put the wrong shipping address! Can you change it for me? We're sorry, but no. We will ship to the address that you give us when you order, so PLEASE PLEASE PLEASE make sure it is the correct shipping address before you purchase. If you ask us to change the address we have to hand address your package and mail with stamps. There is no way to track the shipping this way and it is not safe for us as a shop to send packages without the tracking. For this reason, we will send your package to the shipping address you gave us. If the item is returned to us because it was a wrong address, you will need to pay for shipping again for us to send it to you again. This is for a friend. Can you include a note? Sure! We'd love to! Just tell us what you want the note to say and we are happy to include it. Once I order my jewelry, how long until you send it? Our estimated time to process and send the orders is 3-5 days. We often send them earlier than that, even the very next day. If your item takes more than 5 days to send we will communicate with you and even give you free jewelry! Shipping these bad boys to you quickly is very important to us. My jewelry did not get here on the day it was supposed to! How do I get mad at? We will always send our product within the promised amount of time. (See above question.) Once it leaves our hands, we can not promise that it will arrive by a certain day because the product is then in the hands of the USPS and we can not control the way the work. Generally we have been more than happy with the post office and have found that they deliver items very quickly. However, because the items are out of our hands at that point we simply can not guarantee that they arrive on a certain date so we ask for your patience. On some occasions (Christmas or Mother's Day) we promise that if you order by a certain date you will get it for the holiday and in that case, we allow plenty of cushion time for the USPS to deliver your item. I am being asked to pay customs! I already paid shipping. What is this nonsense?! We have absolutely nothing to do with customs that your country may charge you. We charge you the shipping price that the United States Postal Service charges to mail your address. After it leaves us, we have no control over customs nor do we know what the individual custom prices are for each country. We suggest you look into this before you buy if you are hesitant about paying the customs. I have sensitive ears. Will your earrings hurt my ears? 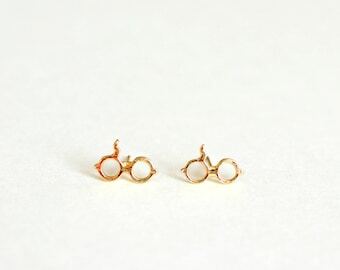 All of our $8 stud earrings are gold plated or silver plated. The post is made of stainless steel. This contains trace amounts of nickel, and in some cases may irritate the ear for those with nickel allergies. If you have sensitive ears, we recommend putting a thin layer of clear nail polish on the earrings before you wear them. This will protect your ear from the metal and generally allows your earrings to last much longer.